﻿ How to Download or Record Medici TV Streaming on Windows or Mac? Learn how to download a perfect digital copy of Medici TV stream without losing quality with Bigasoft Video Downloader Pro. Medici.TV provides the largest online collection of classical music, operas, converts and ballets. Medici.tv is available on the internet and with the Medici.TV application, you are able to enjoy the HD classical music streams and live events on your mobiles and tablets (iOS and Android) or connected smart TV. However, sometimes we indeed want to download Medici.tv videos to enjoy anytime and anywhere especially at the place without Internet connection. This guide just aims to introduce a highly recommended Medici TV Stream Downloader - Bigasoft Video Downloader Pro for you. Convert Medici TV video to Apple iPhone, iPad, iPod, Android smart phones and tablets. any portable devices. Extract audio from Medici.TV or other websites and save to MP3, M4A, WMA, OGG, etc. Download HD videos from 1000+ popular video webistes, including YouTube, Metacafe, Livestream, Dailymotion, MTV, VEVO, etc. Fast download streams from Medici.tv in batch. Reconvert or compress downloaded videos easily. Compatible with Windows 10/8/7/Vista (Windows version) or Mac OS X 10.11 - 10.5. How to download classical music video streams from medici.tv? 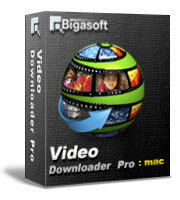 Firstly, download Bigasoft Video Downloader Pro and install it. There are two different versions for Windows and Mac users separately. And the two versions are fully compatible with the latest OS. Bigasoft tools are totally clean, free of ads and plugs. Go to medici.tv and find your favorite classic music video and paste the URL into URL box on the download panel of Bigasoft Video Downloader Pro. Note that multiple URLs can be pasted at the same time, so the medici.tv videos can be downloaded in batch. Click "Save Folder" button to choose the destination folder for the downloaded Medici.tv music streams. For Medici.tv videos, I recommend you to leave "Automatically Convert to" unchecked to get a perfect digital copy of the original Medici.tv stream without conversion and re-compression. If you prefer to get the MP3 version to enjoy on iPod or other MP3 players, simply tick "Automatically Convert to" and then click the drop-down menu to choose "MP3 - MPEG Layer - 3 Audio (*.mp3)" profile from "General Audio" category. Note: There are more than 100 profiles and presets for popular portable media devices, like iPhone, iPad, iPod, Android smart phones, tablets, etc. After all settings are done, click "Download" button to start the Medici.tv streams downloading. Right-click the item in Activity panel and choose "Locate Downloaded File" to get the downloaded Medici TV video/audio. Please note that besides downloading, Bigasoft Video Downloader Pro supports recording Medici TV streams. The build-in video recorder allows you to save live streaming and protected ones that can't be downloaded directly. Learn "How to record live streaming videos".